The most visited attraction is the Madhukeshwara Temple dedicated to Lord Shiva. With a blend of different architectural styles, the temple provides a real treat to the admirers of architecture, apart from the devout. 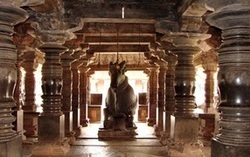 Striking features include the seven-foot huge Nandi idol made of a single stone, splendid monolithic stone works like the stone couch and the Triloka Mantapa depicting heaven, earth and the nether world, amongst others. Several other temples dot the village. Trial 1: This trial is popularly known as the Banavasi Trail . It starts withMadhukeshava Temple tour by the priest. Visit Gudavi Bird santuary. Visit localartisans. See the sunset at Gugnapura. Explore Pampavana and visit Pinaple farmand taste the local pineapples. You can also take a traditional dip in Varda river. Trial 2: The second most popular trial is the nature trail Banavasi to Yana, Trek and explore the beauty of the Yana Cave. Lunch at Manjuguni, After lunch take a beautiful ride to Unchalli falls. Later in the evening take a dip at Sahasra linga. This is the most popular trail and we can include Marikhamba Temple too in Sirsi too or take you to an organic store to buy local organic produce. Trial 3: This trial is popularly known as the Kadamba Trail and allows you to know and experience a bygone era. Banavasi to Balligavi and explore the temples there. Then visit Thalagunda to see the ancient inscriptions on a pillar. Followed by Kotepura, andJade. Trial 4: This trial is popularly known as the Jof falls Trail . Banavasi to YelKundi, then toKeladi , Then Sagar. Visit the famous Jog Falls. Trek a bit at Chandraguthi and return back to Banavasi. Trial 5: This trial is popularly known as the Beach Trail . It starts with Murudeshwara, then Apsara Konda falls and ends with Gokarna. We cover about 350 Km in a day and its a beautiful drive. Being in the western Ghats, Banavasi is close to sacred groves where the bio-diversity lies untouched. Its also close to waterfalls such as those at Jog Falls (one of the highest in Asia), nature spots such as the Gudavi bird sanctuary which hosts thousands of birds each year etc. The Gudnapura lake, sprawling across 100 acres, comes alive every December-January during the Kadamba Festival when the water sports rev up. If you are interested in bird watching, then Gudavi Bird Sanctuary, a small seasoned lake surrounded by moist deciduous forest, 12 kms away from Banavasi would be a riveting experience. Blessed with plenty of rainfall, agriculture abounds around Banavasi. The neatly laid out banana and areca nut plantations or the chequered rice fields offer ample shade for a leisurely picnic. After spending a day wandering around Banavasi, explore the region around. Itineraries have been prepared by the Village Tourism Committee for a 75km radius around Banavasi.